Triallyl trimellitate,also known as 1,2,4-Benzenetricarboxylate, pale yellow liquid, used as pharmaceutical intermediate, also as cross-linking agent in polymerization. TATM triallyl trimellitate can be used, due to its 3 allyl groups, as a highly effective crosslinker. The copolymerization can be carried out with conventional peroxides or irradiation. The resulting polymers have improved mechanical properties, as well as improved chemical and high temperature resistance. keep away from sources of ignition. Store in a cool, dry place. Store in a tightly closed container. 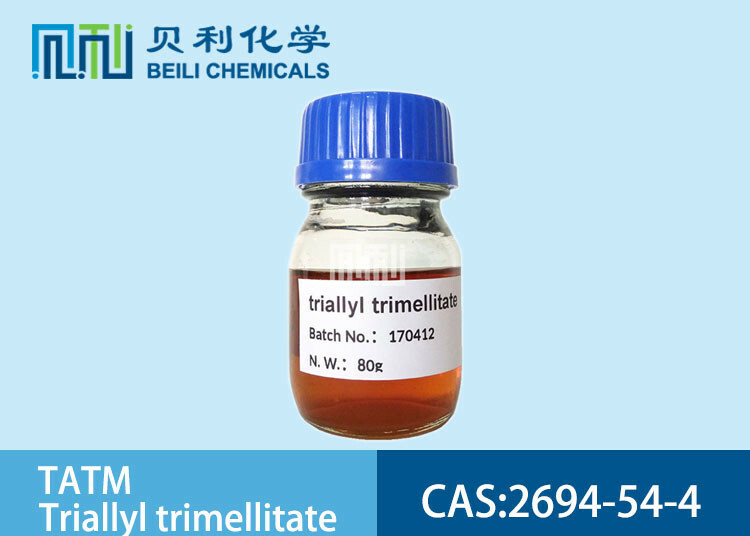 BeiLi is a professional manufacturer of TATM 1,2,4-Triallyl trimellitate CAS 2694-54-4 in China. We can provide costomers with "one-stop"packaging service,from research,development,production,export and so on. 5. Good business credit in UK, Netherlands, Germany, Norway, Italy, US, Japan, Korea,India, Thailand etc.